Please guys don’t think that im speaking rubbish and I went mad,im fine now and what im speaking is absolutely true. Did you ever dream that a guy could fool you through a webcam by disguising as a girl?? Guys ,you need not dress up as a girl to fool others. We have a simpler alternative for you. 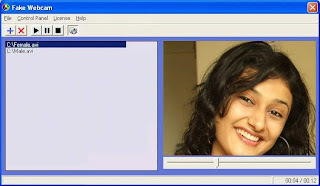 Just get this piece of software “fake webcam” from www.fakewebcam.com and then the rest is as easy as pie. Make sure ur cam is active only when u can change the source.